Dedicated to empowering, mentoring, and celebrating lesbian, gay, bisexual, and transgender (LGBT) youth, LIVE OUT LOUD is a non-profit organization that produces panel discussions, lectures, and workshops that connect LGBT youth with role models and leaders in the LGBT community. In the midst of a national wave of anti-gay bullying and violence, a powerful short video is revealing how one person can change a school - and the lives of hundreds of gay and straight youth - in just one day. Academy Award-winning screenwriter Lance Black (“Milk”) is one of the many LGBT leaders participating in The Homecoming Project, Live Out Loud’s grassroots initiative that brings successful gay adults back to their high schools to share their stories, lessons, and hope with today’s students. For more on The Homecoming Project, read Black’s first-hand essay on his return to his high school at MTV.com, check out this interview in 2BMag with Live Out Loud founder Leo Preziosi, or see Time Out New York’s round-up on the most effective organizations supporting gay youth. PKPR secured a full-page profile of Live Out Loud in this week’s Time Out New York. 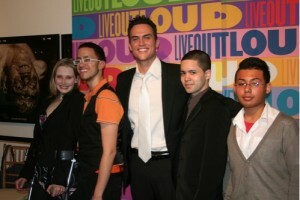 Actor Cheyenne Jackson, star of the hit Broadway musical Xanadu, hosted LIVE OUT LOUD�s Seventh Annual Benefit Gala on Monday, April 28th. More than 400 community leaders attended the benefit, which culminated in the awarding of $2500 scholarships to four high school seniors who have demonstrated outstanding leadership skills. Coverage included The Advocate, Newsday, Fashion Week Daily, Jossip, Playbill, and Broadway World.